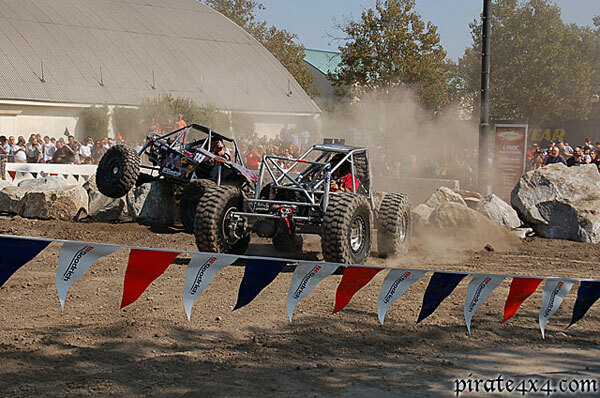 The 2006 Off Road Expo has come and gone. 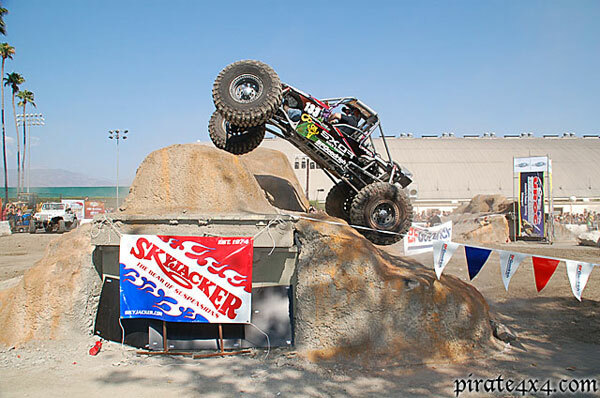 Each year it's amazing to see the rapid growth of our hobby/addiction gauged off the insane growth of shows like the Off Road Expo. The show was huge this year, and was the best one yet. There were your usual suspects - ridiculously lifted trucks, $100k+ pre runners, and rock crawlers. But there were a few other unique aspects of this show that were different than in years past. The Advanstar Communications group had a nice unveiling of the Baja charity rigs at the Sheraton on Friday. 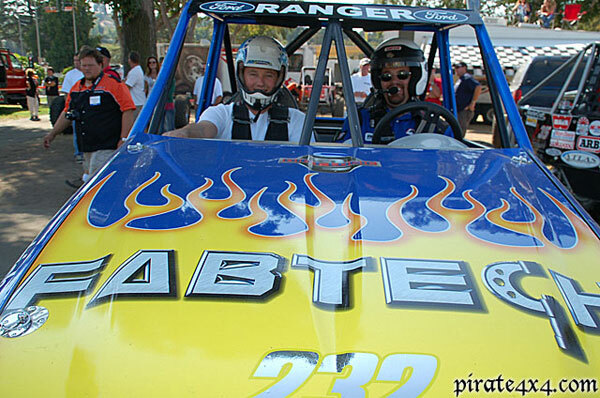 Pictured are the driver and co-driver of the first leg of the race - Chris Corbett and Clifton Slay. Friday morning I attended the unveiling of a very unique 3 car team that will be running the Tecate/SCORE Baja 1000 this year. The team was the brainchild of the good people at Dirt Sports magazine. The idea was to build two class 11 (stock Volkswagen Bugs) and one Pro Truck to run for various charities. One of the Class 11 Bugs was built by Los Angeles County Firefighters, all of whom have never set foot in a race car. Their goal was to raise enough money to purchase 3 "Jaws of Life" to present to the mayors of three different cities in Baja. They met their goal, and are excited to deliver these life saving tools to the people of Baja. The firefighters are looking forward to piloting their fire engine red bug down the Baja Peninsula. The beautifully crafted Wahoo Taco sponsored Pro Truck was built by the Herzog team, so it should be able to handle anything that the Baja desert can dish out. This team will be bringing inner city youths down to Baja to give them an experience they will never forget. And last but not least, there is the Class 11 Bug known as "The Elf". 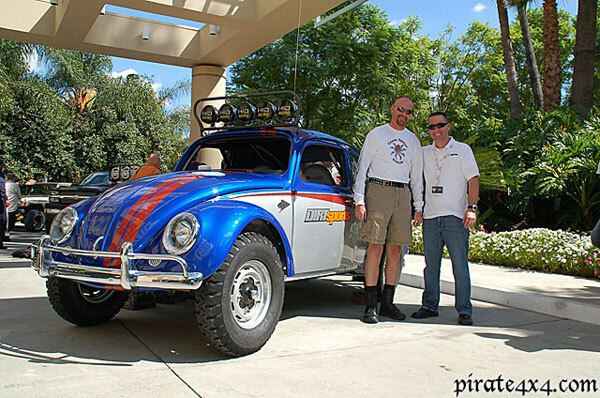 This bug was painstakingly built at The Fab School in Riverside, CA. The Elf will be driven by several different people including Dirt Sports staffers, and professional rock crawler Jason Scherer, who should feel right at home piloting the rear engine Volkswagen. The Elf team is actively accepting donations for the Cure Autism Now Foundation. They are looking for people to donate for every mile that their trusty little Bug completes. 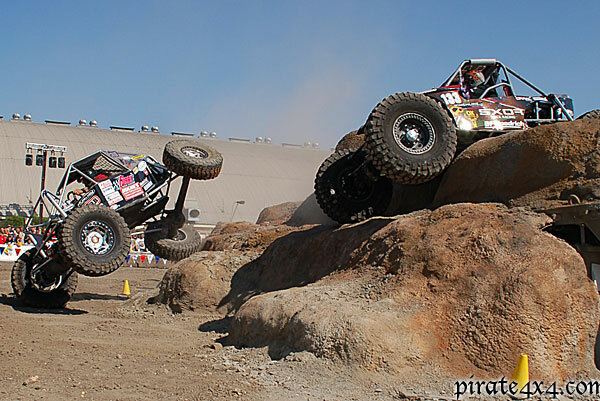 With that being said, Pirate4x4.com is proud to donate $1.00 for every mile Team Elf completes on the Baja Peninsula. We hope to see them at the finish line in La Paz and present them with a check for $1,000! If you would like to contribute to this fun and worthwhile endeavor, visit BajaCharityRun.com. Brad Lovell and Jason Scherer put on a great show and steal the win from belly'd out Mitchie. iDrive TV was on hand to film all the exciting action. Shannon Campbell and Brandon Johnson duke it out. The other really exciting thing that made its debut here at Off Road Expo is the UROC Rock Cross. What is UROC Rock Cross, you ask? It's the cure for those who get bored with watching the sometimes slow and technical action of rock crawling. It's balls out, side-by-side rock racing. Two vehicles line up side-by-side, and when the green flag drops, the winner is the first one to the checkered flag. No backup penalties, no BS. Just lots of throttle and carnage. The crowds really seemed to enjoy the exhibition rock race, as did the competitors on hand. "I just wanna go fast!" said Shannon "Ricky Bobby" Campbell after his first run at the Rock Cross. Shannon is in contention for the XRRA championship next weekend, and had his newly built Rock Racer rig out this weekend. 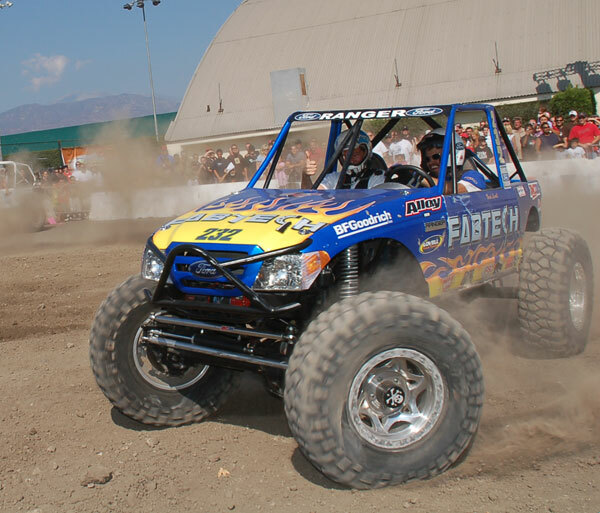 LS1 power, 6" longer wheelbase, and big Fox 2.5 Shox were about the only noticeable differences between his rock crawler and rock racer. Other than that, they look almost identical. Brandon catches some air launching over the gunite climb. 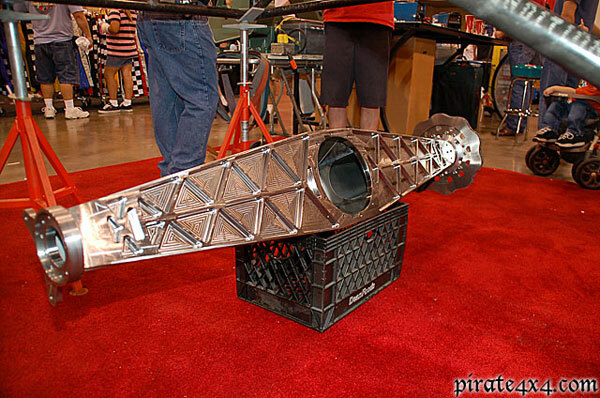 With a bigger than ever show, there was all kinds of cool stuff to be found while wandering through the halls. I oogled at the rows and rows of trick pre runners and trail rigs like a kid in a candy store. There was also all kinds of cool tooling and equipment to be seen. The 54" (yes, I said 54"!!!!!) 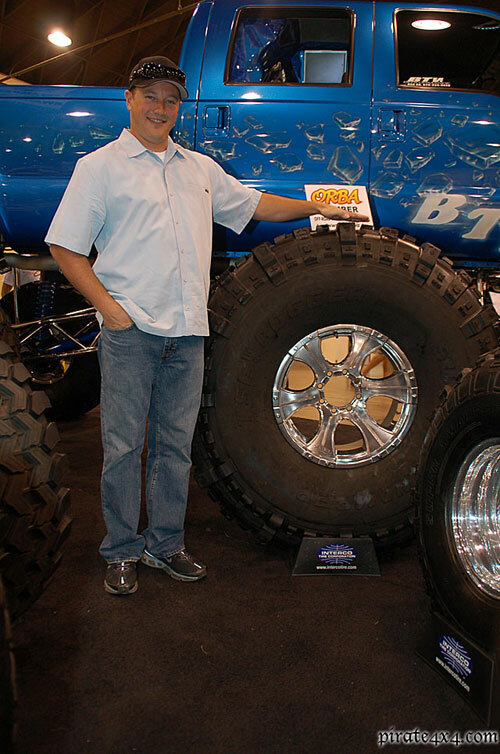 Bogger made a showing at Off Road Expo. This crazy rear end was whipped up by the folks at The Fab School. In all of my travels, I always find my show favorite. Well this time I had two favorites. My realistic favorite, and then my "if I win the lottery, I'd love to have it" favorite. For my realistic favorite, I picked the Petersen's 4 Wheel & Off Road Ultimate Adventure FJ Land Cruiser. This thing had it all - Dynatrac Dana 60s, Atlas transfer case, All Pro coil over suspension, BFG Krawlers, etc. I could definitely see myself cruising the local Northern California trails in this bad boy. I want one!!! Now if I was filthy rich, and could afford anything, there's no doubt what I would own. I have no idea who owns it, who built it, or what it cost to build. What I do know is that this desert pre runner is absolutely the cleanest, coolest machine I've seen in a while. It's got just the right amount of bling without being over the top. This buggy has the coolest, sleekest body work with a low key flat black paint scheme, complete with Monster Energy Drink graphics. The interior was clean, and simple. If I had a couple hundred grand to burn, I'd own that thing in a heartbeat. The Monster Pre Runner is wicked cool.